Have you ever wondered what you can do to support the Enid SPCA? Well now there is another option. Bring your prized pooch into Angie’s Pet Plaza Day Spa and have our professional groomer, Suzan Thompson-Rowley, give your four- legged family member a beauty treatment. We are excited to announce that Suzan is now a member of the SPCA Team. Suzan’s love of animals and their love for her are a perfect combination. Suzan is a graduate of Connors State College with a degree in Equine Technologies. She later attended grooming school at The Pedigree Career Institute in Phoenix, Arizona. Suzan has been grooming for 15 years. 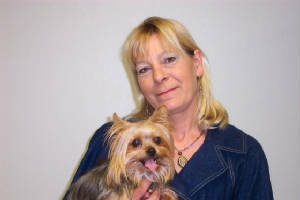 Suzan will be grooming Tuesday through Saturday, so call today to schedule your appointment. Phone: 233-1325, or after hours, 402-7777.